Kengo Kuma, Natoma Architects join SOM and JCFO to revitalize Pereira complex in L.A.
Kengo Kuma and Associates and Natoma Architects have been added to the project team for the recently-revealed 1111 Sunset Boulevard development slated for the former Metropolitan Water District (MWD) headquarters on the edge of Downtown Los Angeles. The announcement of the expanded team—which also includes SOM and James Corner Field Operations (JCFO)—came this week along with a fresh set of renderings for the 5.5-acre project. With the project, Los Angeles–based developer Palisades is looking to transform a derelict section of William Pereira’s MWD headquarters into a 778-unit mixed-use enclave containing retail, public open spaces, and a boutique hotel designed by Kuma. The development consists of three high-rise towers that sit atop a continuous and permeable podium spanning the sloped site. According to the renderings, the complex will contain a cluster of low-rise apartments at one corner surrounding underground parking for a pair of housing towers. As those apartments terrace up the hill, they will give way to a shared plaza at the base of the high-rise towers. Project renderings depict a pair of 30- to 40-story tall towers along this section of the site. Each of the towers rises from the podium on a gigantic pod containing a solid, monolithic core. Roughly five stories up, the tower’s typical floor plates begin to cantilever over the plaza, leaving an open viewshed several stories high from the plaza. The move is an attempt by the designers to minimize the heft of the project along its lower levels and an effort, as well, to preserve certain views for existing hillside residences located directly behind the development. The renderings also depict certain portions of the Pereira structure reused as ground floor amenity spaces. JCFO is developing the project’s more than two acres of landscaped areas. In terms of plantings, renderings depict clusters of palm trees, jacaranda trees along the street, and succulent-bordered lawn areas overlooking Downtown Los Angeles. The project will share the site with Linear City’s Elysian tower development, a portion of the existing Pereira-designed complex that David Lawrence Gray Architects repurposed in 2014. 111 Sunset is among several high-rise, high-density projects slated for the area. An official timeline for the project has not been released. See the project website for more information. 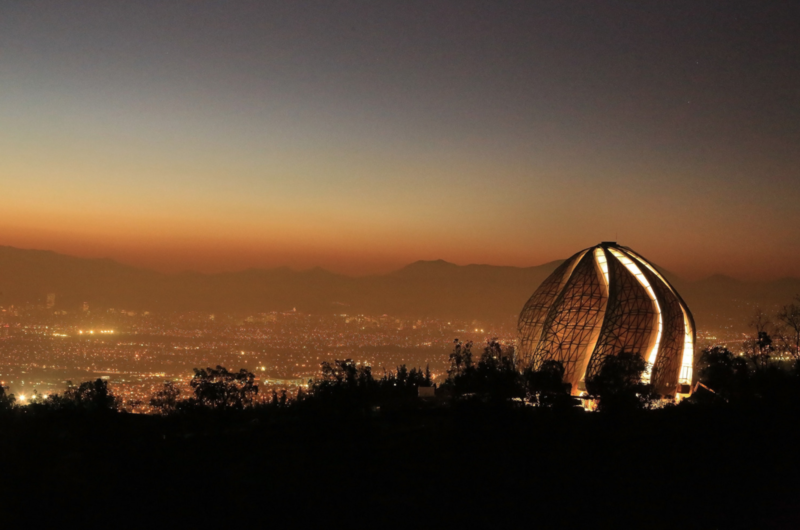 Three finalist teams have released hotly-anticipated designs for a new tower complex at Angels Knoll, a former Los Angeles park now known as Angels Landing. The finalists were selected based on their submissions to a Request for Proposals (RFP) issued by the City of Los Angeles back in January to develop a parcel at 4th and Hill Streets, which was once home to Angels Knoll, a park that closed in 2013. The RFP asked architects to include affordable housing on the one-acre lot, which bridges the neighborhoods of the Historic Core, Civic Center, and Bunker Hill. Urbanize.LA reports that the development will also offer pedestrian access to California Plaza, the Pershing Square Metro Station, and Angels Flight, a historic railway. One design team, Angels Landing Development Partners (ALDP), is led by local developer Lowe Enterprises in collaboration with Cisneros Miramontes, Gensler, and Relm Studio. ALDP's tower design, pictured first in the gallery above, stretches to 883 feet (1.27 million square feet in all). Its building is proposed as a part of the UCLA campus. The tower would include 655 residences targeting university faculty, and it would host ample academic, office, and adaptable program space. The renderings depict an irregularly stepped tower of terra-cotta and glass with publicly-accessible terraced landscaping and green roofs on a few of the setbacks. Another team is comprised of Onni Group, a Vancouver-based developer, and Stanley Saitowitz of San Francisco–based Natoma Architects. In the renderings, two unevenly stacked steel-and-glass massings stand at respective heights of 840 and 410 feet tall. The shorter structure would include condos and a hotel, while the taller tower would include apartments, commercial space, and an elementary school. Two acres of open space are incorporated into the plan at ground level and at California Plaza. Angels Landings Partners (ALP), the final team, is a partnership between MacFarlane Partners, the Peebles Corporation, and Claridge Properties, as well as Handel Architects and Olin. ALP has also proposed two towers for the site, one at 24 stories and another at a lofty 88 stories. These structures would incorporate 400 rental units (20 of those affordable), 250 condos, and 500 hotel rooms. The buildings, with 57,000 square feet of open space, would also include extensive retail space and a charter school. 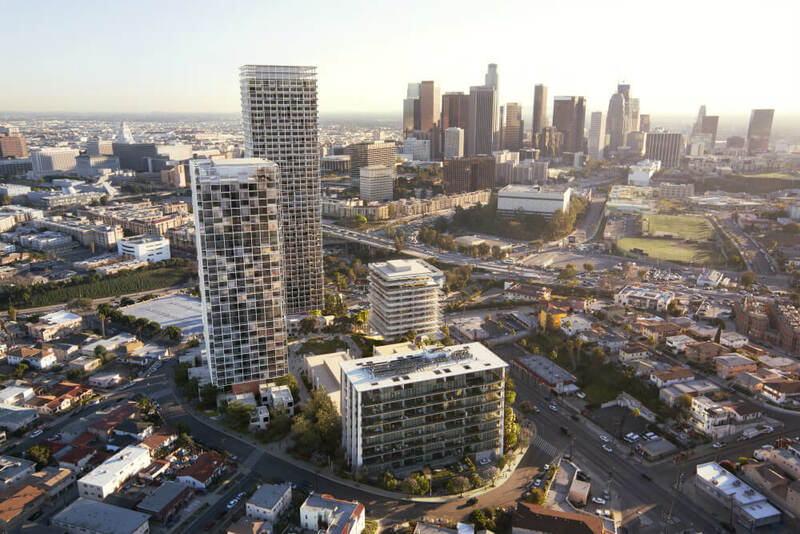 If ALP's design were to move forward, the towers would become the largest minority-owned development in L.A. The city plans to select a developer for the project in November. San Francisco–based Natoma Architects has revealed renderings for 1360 Vine, a new 21-story stepped tower proposed for downtown Hollywood, California. The 429-unit project—which is being developed by Canadian firm Onni Group—would also bring 60,000 square feet of commercial space and 15 live-work units to the area. The project is slated to include a 677-stall parking garage as well. Development agreements allow for the project to contain either 50,000 square feet of offices and 5,000 square feet of retail or a 55,000-square-foot grocery store. According to an environmental report published by the Department of City Planning, the project will require the demolition of an existing eight-unit multifamily complex and several small scale industrial buildings currently occupying the site; six existing bungalow homes will be preserved and reused either as housing or restaurant spaces. The new construction will encompass a mix of studio, one-, two-, and three-bedroom units, 16 of which will be set aside as deed-restricted affordable housing for very low-income residents. The developer has also agreed to provide 19 affordable units off-site; a location for those units has not been specified. The preserved bungalows will be separated from the new tower by a broad pedestrian paseo line along the tower side by retail uses. The stepped tower—which is U-shaped in plan—will step up rather steeply from the bungalows, revealing a series of terraces as the mass climbs in height. Along other exposures, the black glass-clad tower will feature projecting balconies that overlook the street and a central courtyard. 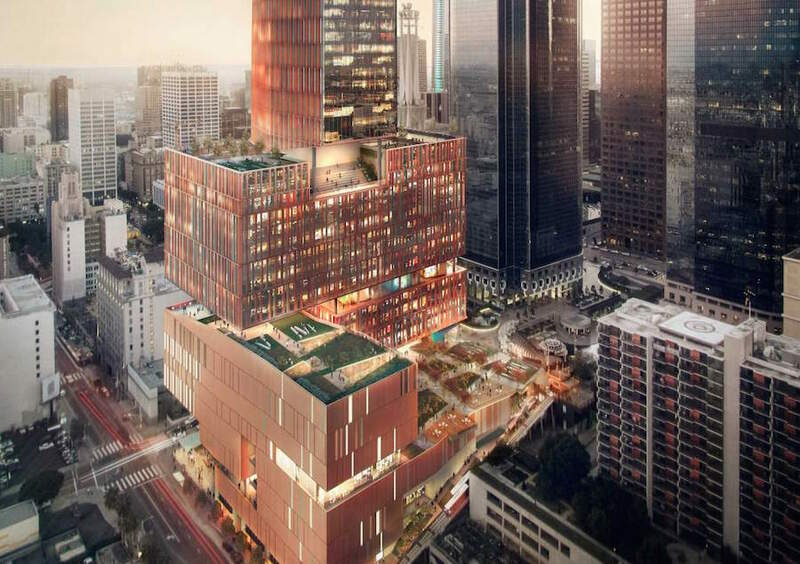 The developer behind the project is also working on a bevy of high profile projects across the city, including a pair of forthcoming towers proposed for lots adjacent to the historic Los Angeles Times complex in Downtown Los Angeles. 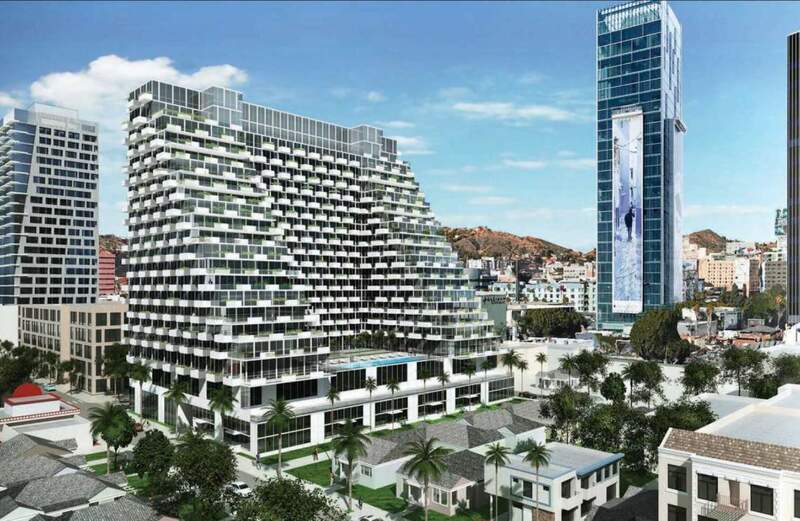 Onni is planning for a total of 1,125 units and 34,000 square feet of retail in those structures; the new towers would replace the Times Mirror complex designed by William Pereira. 1360 Vine is expected to finish construction in 2021.